On a dreary January day, Year 9 set out to visit three local churches: Twynholm Baptist Church, All Saints Church of England and St Thomas of Canterbury Catholic Church. They came armed with questions about faith and ethics for each religious leader they met. 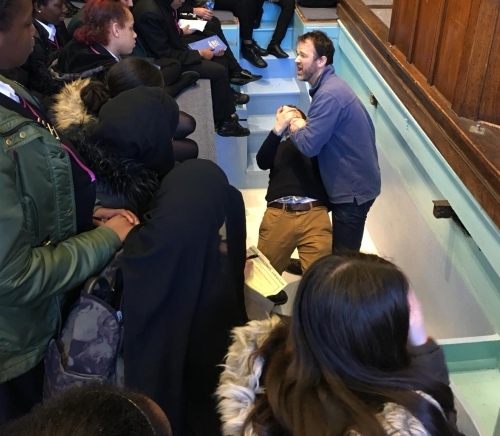 Their goal was to begin to formulate how to approach the central GCSE theme: why don't all religious believers agree with each other, even when they come from the same religion? "If humans have souls, how do you know animals don't?" "If we all deserve punishment according to the Bible for being sinners, why don't we just do all the fun but bad things since we'll still deserve the same?" "Why do you think that communion is symbolic but the other churches believed the bread transforms into something miraculous and special?" As ever, their astute observations of the places of worship, religious curiosity and perfect behaviour impressed all three churches and made for a perfect (though wet and cold) day out.